Flat, round T®1 Plugs can be used to repair primary and recurrent hernial defects, either inguinal (direct or indirect) and femoral, to obliterate enlarged inguinal ring or femoral orifice dimensions. The plug must be modelled in dart form and fixed to the posterior wall of the inguinal canal. 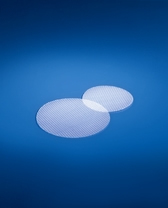 The two size versions allow the surgeon to obtain an optimum dart form to best adapt to the hernial defect dimensions.